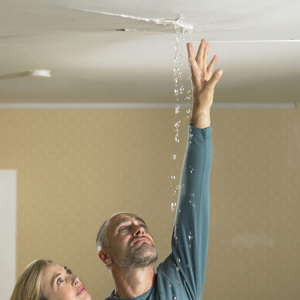 Fixing water leaks can be confusing. We hope this multi-part series simplifies the process for you. Eek! A leak! You see the drywall sagging, the paint peeling or any of the hundreds of ways water can get into your home. Where is it coming from? What should you do? Who should you call? We recommend a professional do the investigating, but these tips can help you recognize what needs to be done, and if it’s being done right. Step 1: locate the source of the leak. Step 2: Determine who to call to get an estimate Step 3: Have the repairs completed correctly. Step 4: Follow through and monitoring. In this article we will focus on step 1: Locating the leak. This would seem like an obvious thing to locate. In some cases it is, but water can be elusive and tricky. To help us determine where to start looking, we should first identify the type of leak we’re dealing with. Constant leaks: A constant leak can be any size from a drip to a shower that never stops. This makes locating its source a bit easier, albeit more frantic. While there is a time sensitive nature to a constant leak, it’s important to remain calm. Start with all the simple things. Ensure no water is running either inside or outside the home. After that, check the water meter as well to see if water is still flowing somewhere. If water leaks continue after this investigate other types of water sources. As an example; there is a feed line bringing water to the whole home humidifier which can leak. An air conditioning specialist can check for condensation on air conditioning ducts causing a slow leak. Cracked condensate pans can also leak. Either way the goal is isolate the leak. We need to eliminate the need to cut open random areas in search of the source. Once it’s known which line is bringing the water to the leak source, that pipe can be followed and less intrusive investigation methods can be used. A plumber is advised for repair. Later in this series we’ll discuss who to call, how to pick the best company and tips for avoiding problems throughout the entire process. Remember to check our Facebook page for updates. Intermittent leaks: Water leaks that only occur during certain conditions are considered intermittent. They are far more difficult to diagnose than constant ones. If a leak only forms during heaving rains, but not during light rain: that tells us something. Driving rain can get into places calm vertical rains cannot. Ice and snow can also do things that other types of water cannot. It’s important to remember some slow moving leaks can last even a few hours after the source has stopped. Recently a customer called us about a leak in their ceiling. It was dripping from their recessed lights during heavy rains. Its location in the middle of the room on the ground floor was odd. We noted their masonry chimney integrated into the adjacent wall of the kitchen. Since we go from low to high, we checked rooms above and found no water damage. At that point we headed onto the roof. There we found a gutter leaning in the wrong direction. Leaves and debris were causing overflow, but only during heavy rains. We also noted a four inch long crack in the shoulder/wash of the chimney. We added water to the gutter and confirmed that when the water overflowed it trickled into the crack. This crack had been caulked with clear silicone. The caulk peeled away, but even when it stays it only locks moisture in, which is worse for masonry chimneys. After entering the crack the water managed to contact a beam inside the exterior wall of the home. It trickled its way down the beam until it pooled on the top of the drywall covering the kitchen ceiling. It traveled over the top of the ceiling until contacting the recessed light fixture. There it began to drip onto the countertop. This was two floors down and fifteen feet away from the leak source! In this case, the leak was solved by performing a basic masonry repair and water protection. It also prompted the customer to look into having their gutters addressed. Not to mention opening their walls and ceiling to check for black mold. They discovered a large amount of black mold in their home. It became clear that the leak was occurring other times as well. It only reached the light during the heavier rains. The important thing to remember in this unfortunate case is that someone did notice the leak. This damage could have been avoided. The leak was not repaired properly, nor was it monitored after the fact. Locating the source of water leaks can be tricky. Knowing what to look for and how to find it can save you time. It will also limit aggravation, and potentially thousands in future repair costs. Be sure to hire the correct professional to investigate your leak and you’ll be worry free. In the next article in this series we’ll cover tips on choosing a professional. Feel free to email us with questions about your specific leak. Like us on Facebook for updates on this article series and more.